In this article I’d like to show you a java implementation of Dijkstra’s Algorithm I’ve written. * Created by weli on 26/02/2017. 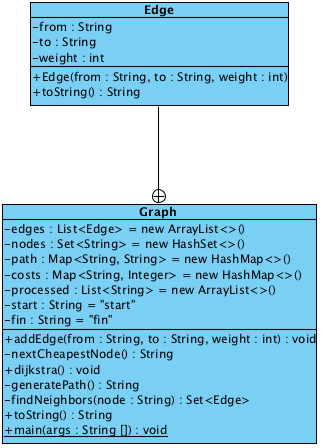 The Graph class is to store the structure DAG, of which the full name is Directed Acyclic Graph. The Graph contains a lot of edges, so the Edge class is to represent the structure. This table stores the weight sum from the start point to the target node. During calculation process, this table will be keep updated. Another important thing is that we use Map<String, Integer> type to store the node <-> weight sum pair，because the Map type is simliar to the Set type, it won’t accept duplicate key value, which means it won’t contain multiple entries for same node. If we put a String <-> Integer pair with an existing String value in Map, it will just update the existing entry. That is just what we need: to update the node <-> weight sum entry with new value. We need to consider two conditions as shown above: Firstly, we need to check if the added edge is connected with start point. If so, we need to save the true weight into costs table, because they are initial edges need to be calculated by the algorithm. As the diagram shown above, b is connected with both start and c, so it belongs to two edges: start -> b and b -> c. In this case, if we add edge start -> b firstly, the cost of b will be 1 in costs table. The path is the parent data structure in the book, it contains the to -> from data pair. We can use this data structure to generate a complete path from end to start. Why it’s from end to start? It’s determined by the algorithm calculation process, we may have some orphan paths in above data structure as the result of updated costs calculation, but we can always find a sole path from end to the start. We can see the cheapest path has been changed accordingly. Dijkstra’s Algorithm is an interesting algorithm and worth studying.